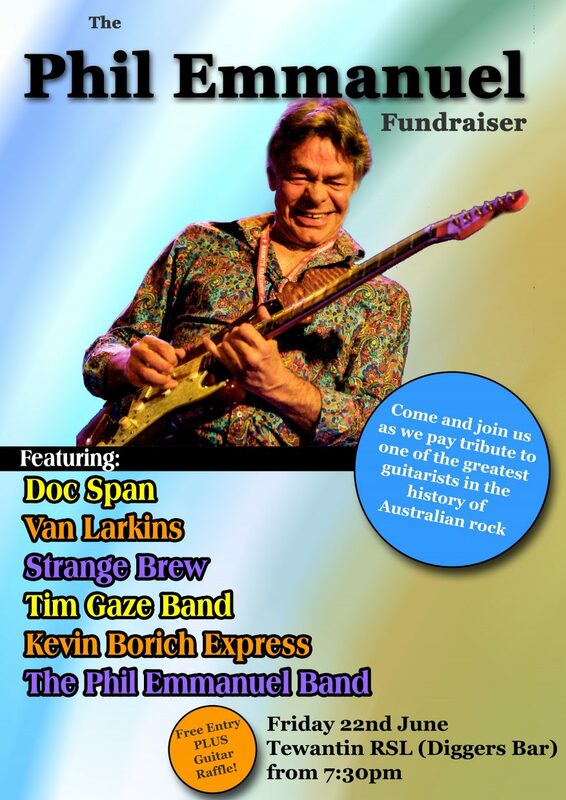 Tewantin/Noosa RSL, 7.30pm Friday Night 22nd June will be a fundraising Benefit for the Wife of Phil Emmanuel. This night has been put aside by Tewantin/Noosa RSL and a group of Phil’s fellow musicians and friends to come together to celebrate the life, Music and times of one of Australia’s favourite sons Philip Ernest Emmanuel (Phil) and to support his wife Amanda by way of raising funds to cover the cost and support her while going through this very hard time. Phil was a man who gave so much time and knowledge to other aspiring and fellow artist, charities, families and any worthwhile cause. So much so he had little time for himself, but you never heard him whinge about it, he just gave. If you want a great night’s entertainment by some of Australia’s finest musicians – entertainers, then come one and come all to this event and have a chance to support Amanda. The following entertainers have all played with and are great mates of Phil’s. There will be a chance to win a guitar signed by all the entertainers, production crew and meet the Entertainers. Have a picture taken with a great print of Phil and his Guitar. Shane Kells and Strange Brew.